First of all, I would like to take the opportunity to wish everyone a (belated) Happy New Year! Today is my due date and still no sign of baby. Exciting times, and it's hard not to focus on everything I feel in the belly area. So... I've taken up on some new sewing projects for me, post-pregnancy. It is odd to start a project which I may not be able to finish due to other obligations, but as the baby may still be waiting 1 or 2 weeks, why not? It is distracting and I found some really cool patterns. 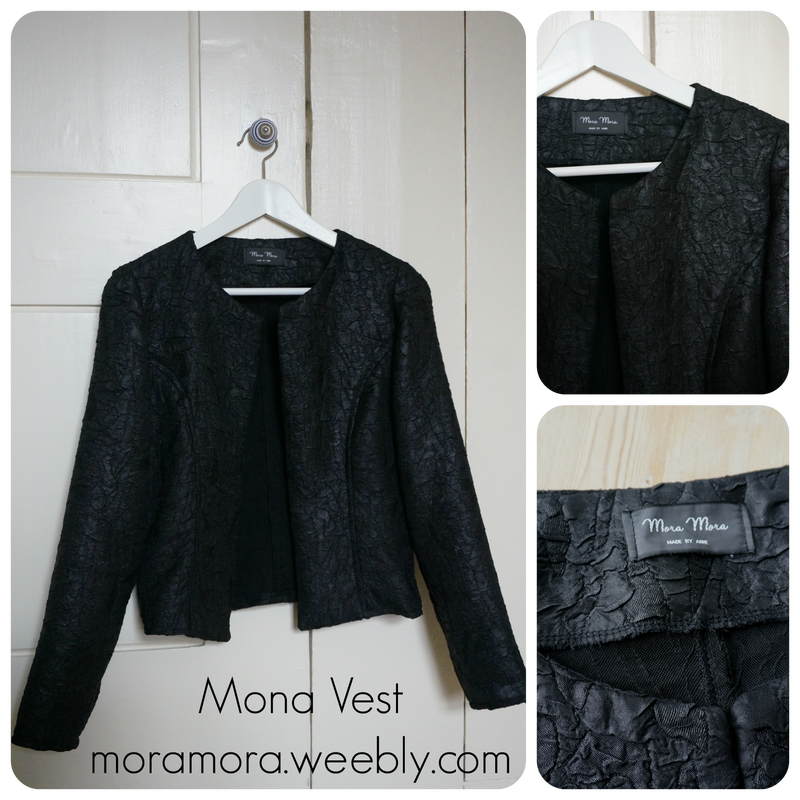 First is the Mona Vest from La Maison Victor. I can/will not show you how it fits me yet, since my belly is enormous and I look terribly tired..:) But I can assure you that at the shoulders and the back it sits nicely, which in case of this pattern is the most important thing. I used a fabric I purchased some time ago at the Stoffenspektakel, a sort of black satin with a crinkly effect sewn into it. I like how it almost looks a bit like leather. It frayed like crazy so I overlocked the edges of every pattern piece first and that way it soon became a very easy project with a professional finish. I did not line it, I only put underlinement on the facing parts. It was a really easy, fast project and - if time and baby allow - I am definitely going to make more versions. This is one of those jackets that you can wear on almost any occasion, and you can make it in almost any type of fabric. LMV advised boucle (and leaving the edges unfinished with on purpose fraying) but even denimn is possible. I already look forward to wearing it when I have my own body again! How did you manage in the last phases of pregnancy? NB: See my new Mora Mora tag? I ordered them at Nominette and I think they are great! For my Dutch/Belgian followers: La Maison Victor has 25% promotion codes every once in a while in case you're interested. 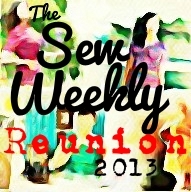 For a while, blogging and sewing was quite low on my priority list. Being pregnant limited the number of garments I could sew for myself (fitting issues, how will I emerge from this pregnancy? etc) and the belly and back complaints didn't make it really easy either. However, in 9 months you can finish a lot of small DIY projects for babies, whilst sitting in front of the TV, or for a short while behind the sewing machine. And now that baby is almost there I would like to share a few of them with you guys! We want to keep the gender of the baby a surprise, so at the moment I can only share a few of them. I made most of these before I was 20 weeks pregnant, and it seems ages ago! This is a bit fiddly, but definitely doable. I used the fabric from my trench coat and a cute yellow gingham I had left. The head has to be sown on by hand which is kind of creepy! I liked that it is knitted from the top down. I had to redo the front bands a few times to come up with the right gauge and button hole placing but eventually it worked out. I also made a short sleeved version in white. 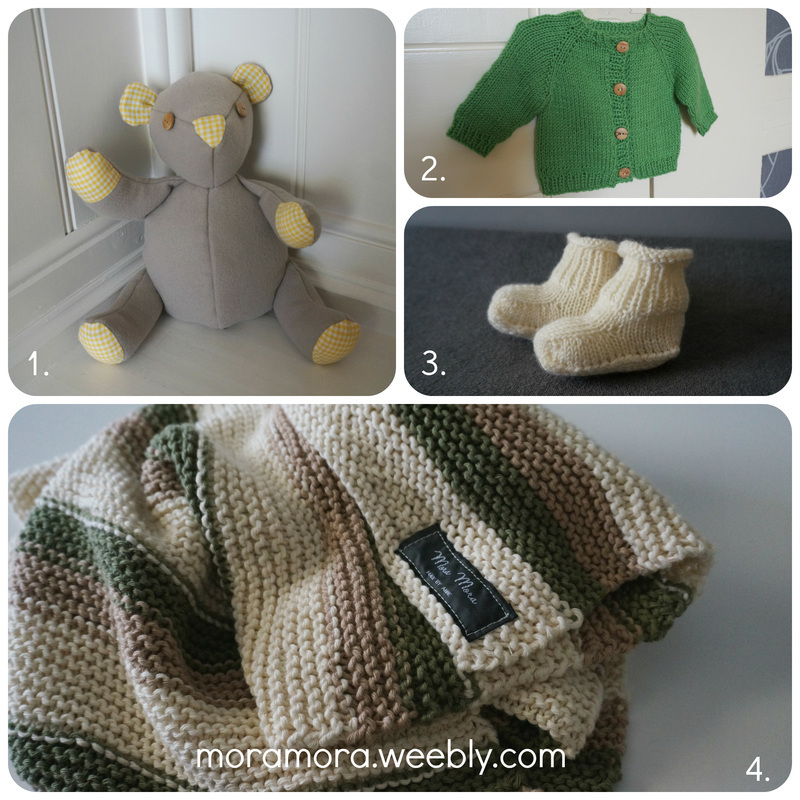 Baby clothes are so fast to knit as they are so small! I love it. Did you make many things for babies? What was your favourite project? It seems I have a thing for green skirts huh? Well actually this skirt and my forest green Zinnia are the only green garments I own. I became interested immediately when Colette first announced the Colette Guide to Sewing Knits, finally a guide that explains how to finish necklines, the different types of knit fabrics and how to handle them, all in one. Then came the release of the patterns Mabel and Moneta! I allowed myself to buy one.. but which one was it going to be? The Mabel version 3 looked a lot like one of my favourite Anthropologie skirts (a black stretch pencil skirt with a floral panel in the front), so eventually I went ahead and bought Mabel. I cut out a size S (based on my waist circumference at that time...) and just went ahead with it, even though at my hips I am a size XS. This first skirt was going to be some sort of a muslin anyway, because I have a really pretty punta di roma waiting for it! I love having a sewing room so that I can cut out the pattern one night, cut the fabric another and then put it together on a Friday afternoon! And in the mean time no need to tidy up:) It was really fast and must say I really like this pattern! I wore it a lot this summer, combined with a stripey or black t-shirt. The second version will have to wait for a bit. In the mean time - now that the news is out...- I'm definitely going to show you some finished baby projects! 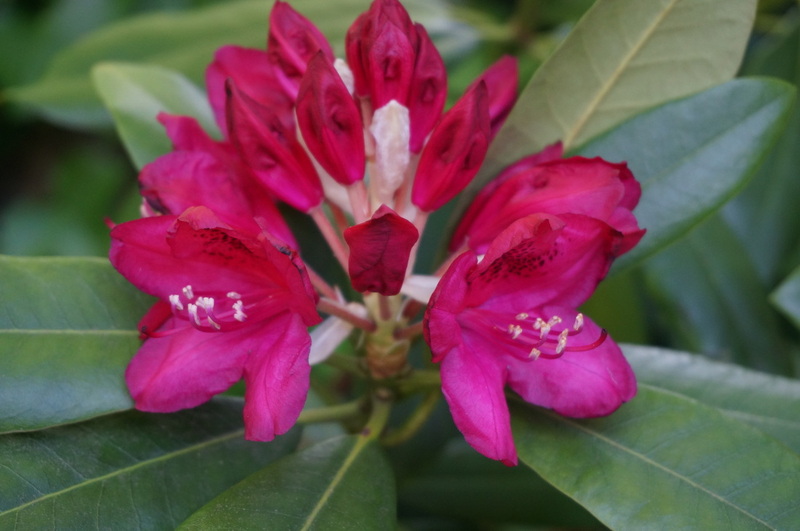 Just wanted to share some recent photos of the flowers in our garden. I am in love with this season! Guys, how are you doing with #mmmay14 so far? Me, not too bad, I forgot to tweet one outfit (!) and cheated a bit this weekend wearing nothing me-made 2 days in a row and now making up for it, wearing the Owls sweater yesterday and my most recent make today. 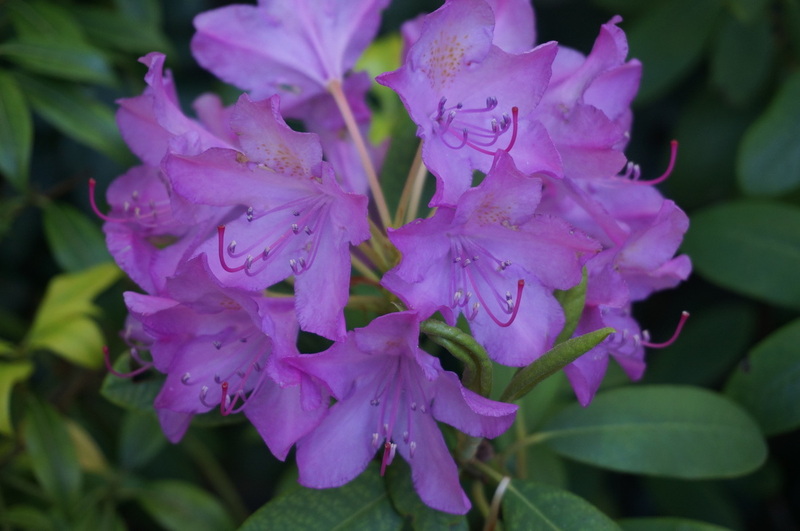 Since this is the first time in about 3 weeks the sun is out, I decided I could best do a photoshoot immediately and blog about my latest creation. As you may know I made a peplum top once, drafted from the top of the Laurel dress and a ruffled peplum attached and I love this top. I wear it all the time, to work even. 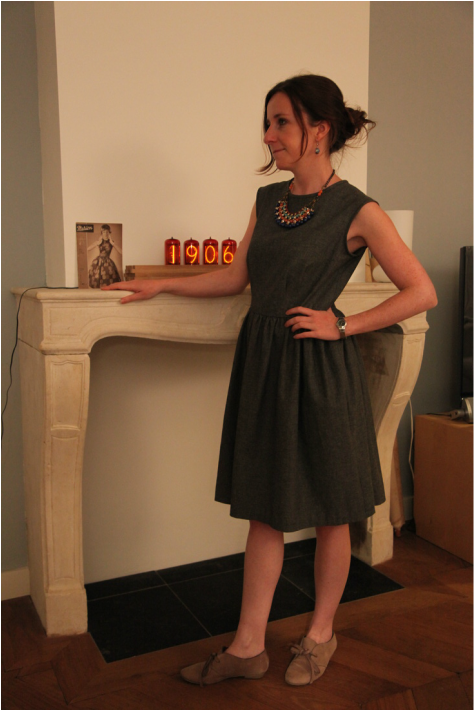 Also I bought the Emery dress pattern aaages ago and was a bit frightened of adjusting the pattern. 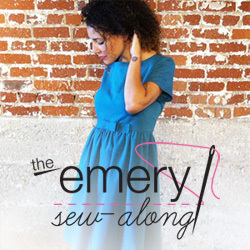 You see, my body turns out to be a little weird when it comes to sizes (xs-m-xs) and I just wasn't sure how to handle this in case of the Emery bodice. But thanks to the lovely ladies of Studio Jurk I was. I followed a workshop on adjusting patterns there and I learned a lot of new stuff. Like you need to measure the pattern on the paper and compare it to your body at the point where the garment is actually going to sit (am I making any sense??). Very useful. So of course I was going to make a muslin. And the muslin turned out so well I decided to make a peplum top out of it. 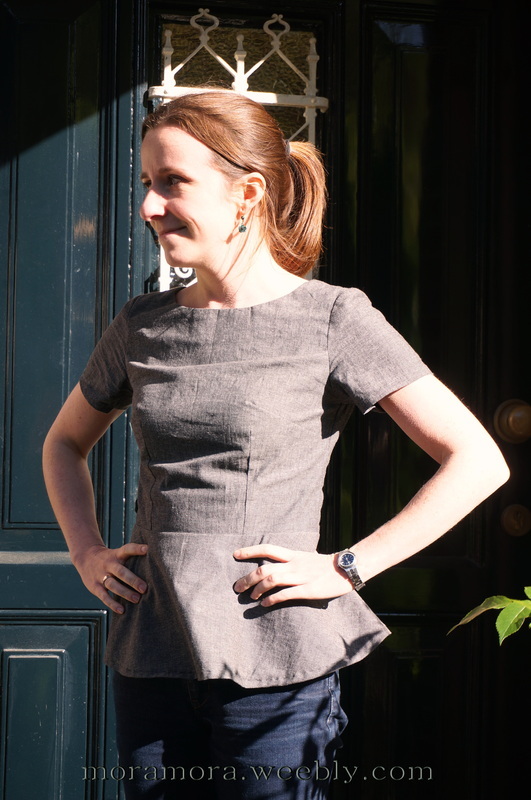 This time I used the By Hand London circle skirt app to make the peplum (the half circle skirt). And the fit is just perfect! This photo is a bit dark, I just love our new house and our new ginormous map of Europe! 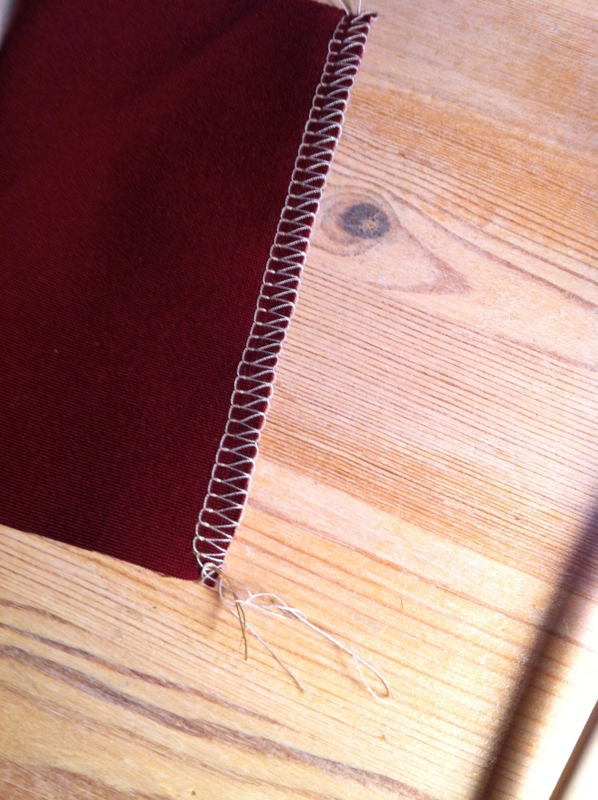 I didn't take photo's of the insides, but they are very pretty thanks to my new serger. By the way, I completed most of the top at my mothers, we did another Mother's Day sewing bee! 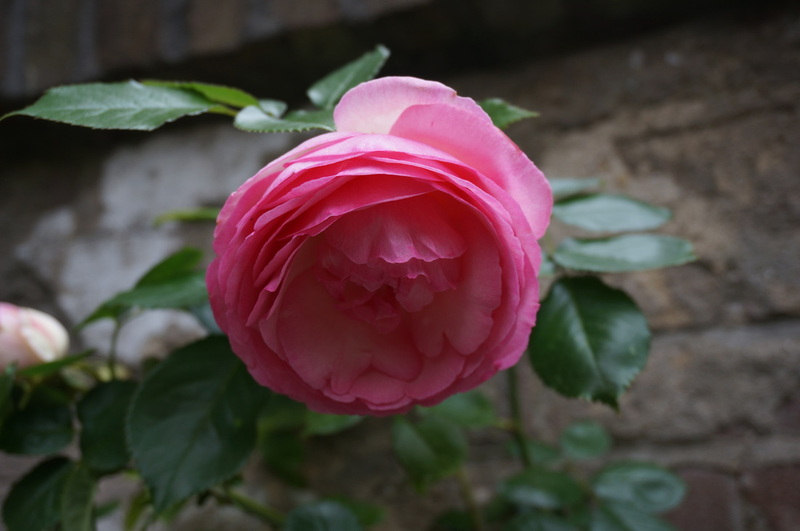 Lovely day at my mothers while it kept raining and raining. Should become a new yearly event! Now that we have a new house it means that we need to have many new curtains. We inherited the old ones from the previous owner, but unfortunately they don’t really meet our wishes and are only good for now. So I thought this would be an excellent moment to combine house time with sewing time and make curtains for my sewing room! 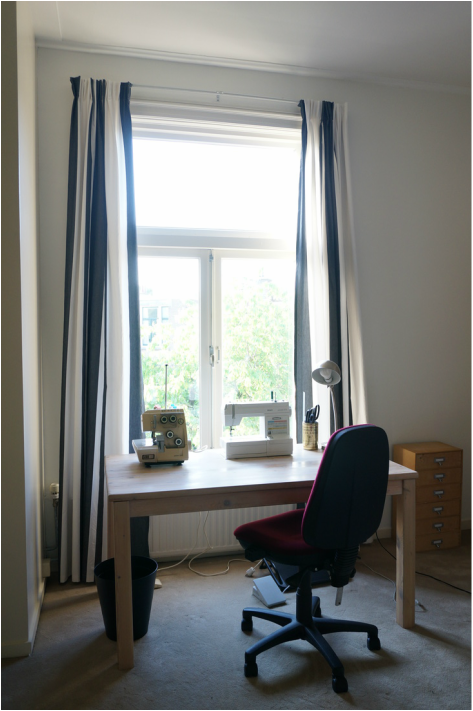 So I went ahead and bought curtain fabric that was on sale for €0,99 a metre at Ikea, the Persby hooks and the Kronill curtain band and made several calculations for the width. Finally I reckoned I could use the width of the fabric for one curtain, if I was a bit creative with the band and hooks. This would save a lot of trouble matching the pattern and sewing straight seams and ironing, etc. I first tried to blind stitch the bottom part of the curtain band but then the creases wouldn’t hold as nicely, so I stitched two rows with white thread (maybe transparent thread would be better because the fabric has grey and white stripes, but I like the visible stitching J). this team is ready for some sewing! It was fun to make them and I am very happy with how they turned out, actually! 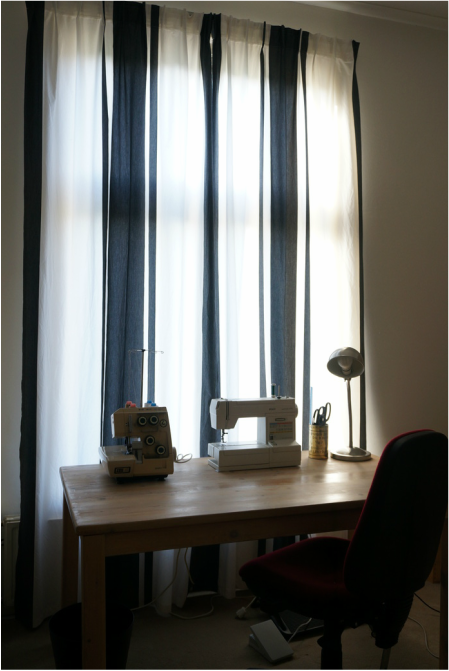 Have you made curtains? What are your tips & tricks? 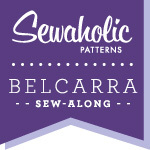 Maybe this does not sound like a challenge to most sewcialists, but to me it does. Only too often I skip the me-made items in my closet to put on something RTW that I know, and is actually boring and safe. And since I don&apos;t have so many items the &apos;every other day&apos; part gives me time to wash and combine with other (even RTW) items. I&apos;m not really sure how I will document all of this, but I think I will share most of it on Twitter. Maybe if I am really happy about a certain outfit I will blog about it. For sure I will... because I have some new items to show you! 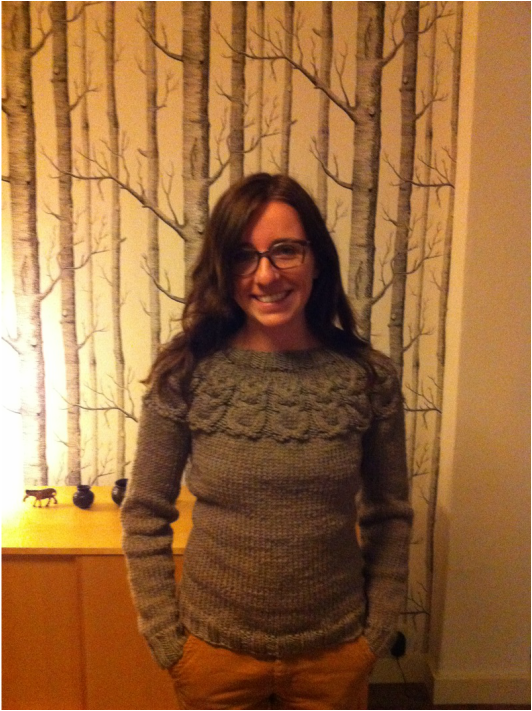 ﻿Just got it under the wire before it is full blown spring: I finished the Owls sweater by Kate Davies! It took me about a month (March), which is amazingly fast for me. That was one of the reasons I wanted to make it, because many people said it was such a fast knit. And I always really, really liked the look of it on everyone. Even though it’s bulky yarn it looks very elegant. 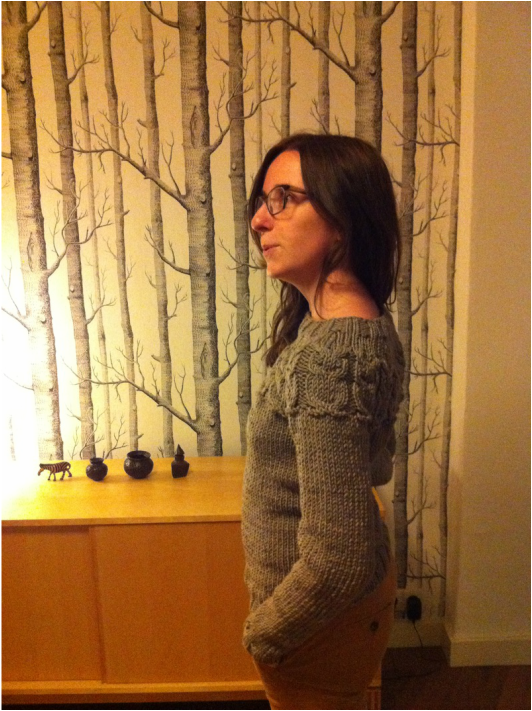 To be honest, this is the first sweater that I knitted that fits, and that I actually want to wear outside of the house! Half-way I thought it would be too small so I considered pulling it out and start again a size up, but I am so glad that I didn’t. I didn't bother with the eye-buttons, I like the owls as they are. For other knittish details look at my Ravelry notes here. Also, with May starting off with some chilly days (like, 12 degrees C, brr) I can wear it for Me-Made-May! It's incredibly comfy and warm. glasses and forest wall paper, can it be owlier than this? who can resist a hoot in these circumstances? 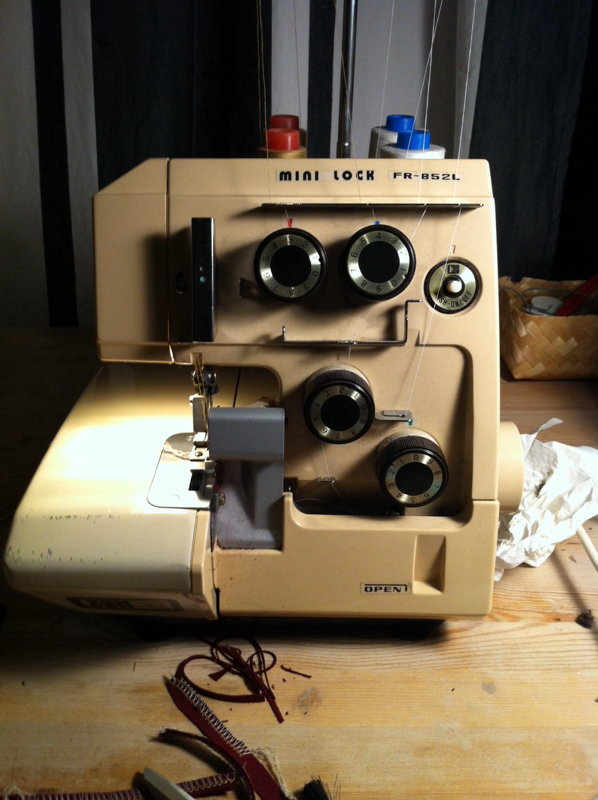 This weekend I was given a wonderful present: a Mini Lock serger by my mother in law. The first test scraps have already been sewn and I can&apos;t wait to get started on all the knit projects I&apos;ve been postponing until this moment...! I like how it looks a bit vintage although it is from the 80s. Definitely a cool addition to my sewing room interior! Hopefully I can soon show you my first makes with it. Do you know this type of serger? And what are your experiences with it? 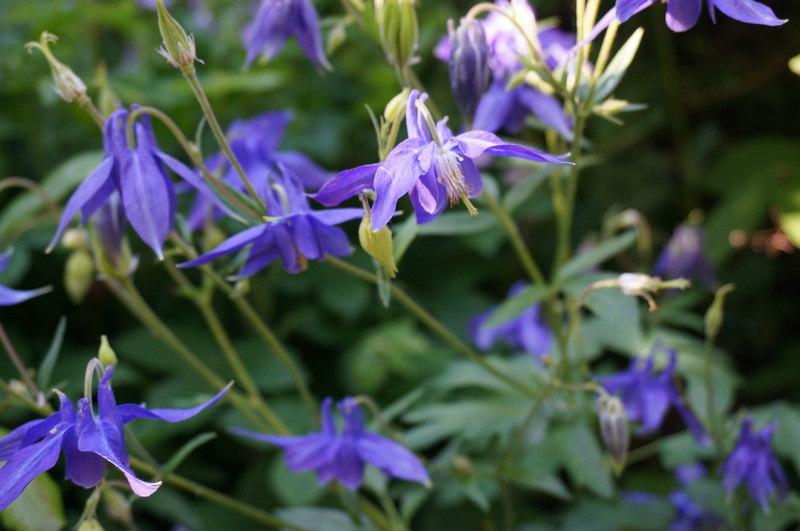 My apologies for being silent on the blog for a while, but moving to and redecorating a 100 year old house plus a vacation to Tanzania really didn't allow for much blogging time really, or sewing. But I'm back at it! 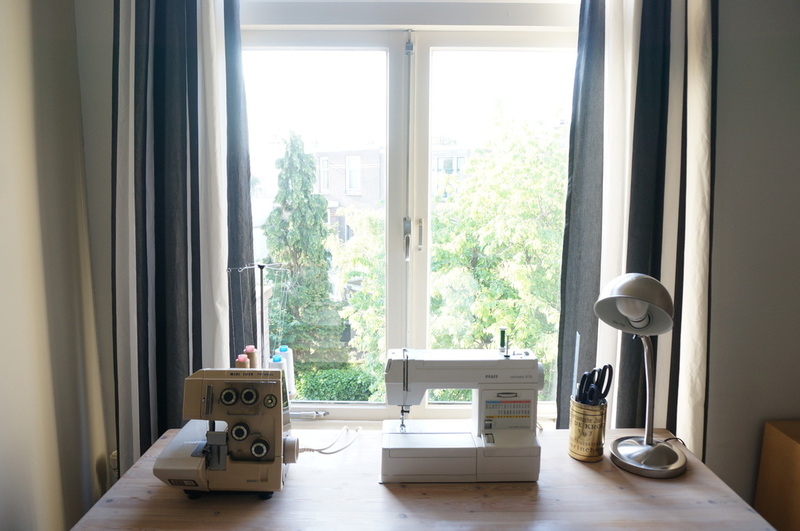 This weekend I missed sewing so much that I decided to put the sewing machine on the dinner table and just sew! Anything! Those of you who follow me on Twitter may have seen my latest find, vintage Marion magazines from 1961 that include some patterns that can be traced (most had to be ordered though, which of course is not possible anymore). They are so cool and so Mad Men! I was drawn to this dress on the cover of the April number, and surprisingly enough, the pattern for size 36 was on the radar sheet. There were only three pattern pieces so the tracing was quite straightforward, although finding the folds and darts was a bit hard. I've sewn it up without any instruction and I have to say, I love it! The body isn't very fitted and I left it like this, so I can pull it over my head (the skirt is attached to the waistline). There were 4 folds in the front and 4 darts in the back. I lowered the neckline because it was almost choking me, and enlarged the armholes a cm on each side. I made bias tape from the fabric (chambray from the market, VERY cheap, don't tell anyone) and used this to finish the neckline and armholes. 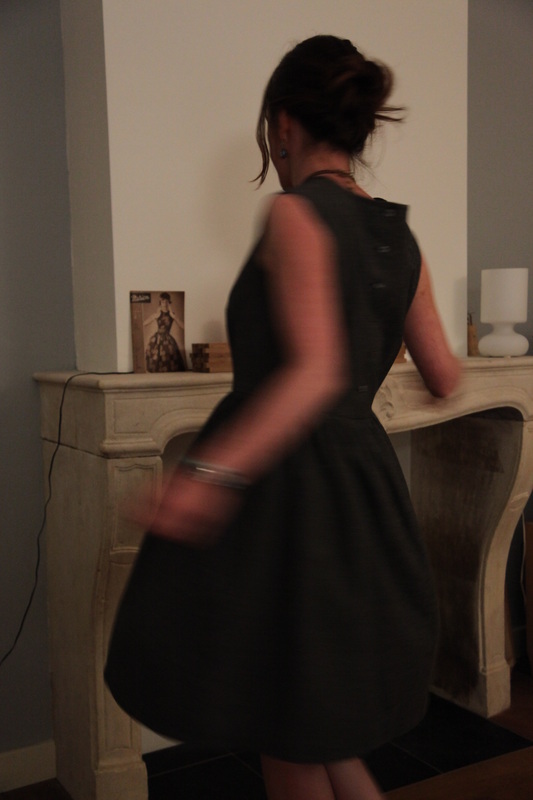 The skirt is ruffled and attached to the bodice, very easy, and I blind-stitched the hem by machine. The closing is buttoned, which makes for a nice detail on the back! 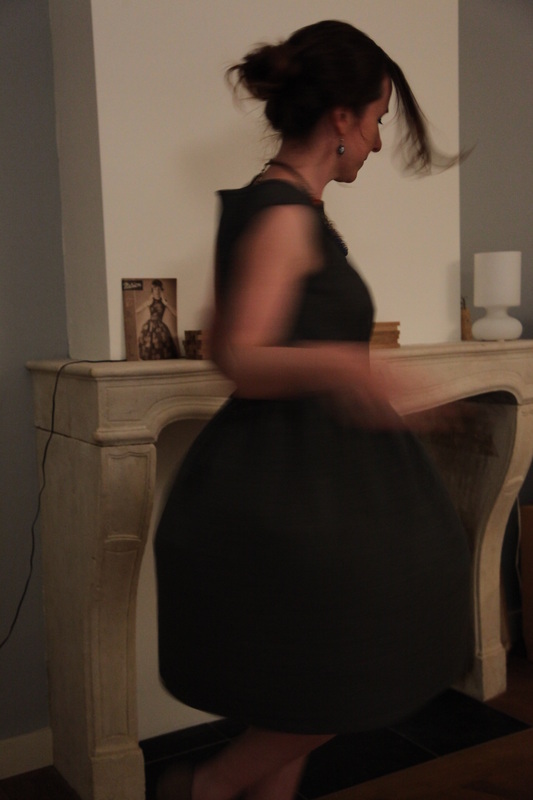 With my Anthro necklace it does look like I actually bought the dress there doesn't it? BTW: I watched all episodes of The Great British Sewing Bee while sewing and after a while I could just hear Claudia Winkleman tell the viewer "Anne is making a dress from the 1960s and is having trouble with her topstitching...." HA! 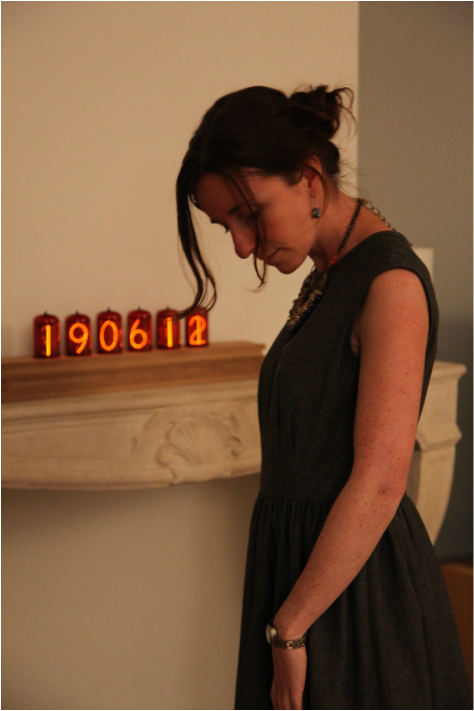 Photography and nixie clock in the background by my husband.